(Newser) – Ferry, upside-down. Engine room, flooding. Air pocket, shrinking. But engineer Augustine Charahani found the peace of mind to curl up on a flight of stairs and wait over 40 hours in the hope rescuers would find him, the New York Times reports. 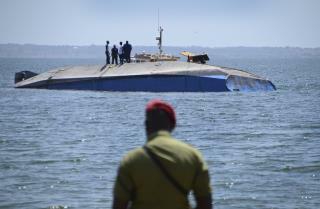 His ordeal began Sept. 20 in Lake Victoria, Tanzania, where the overcrowded ferry capsized about 160 feet from its destination, Ukara Island. Seems a sudden turn by the pilot or a rush of passengers when disembarking caused the boat to flip. About 40 managed to swim ashore and 228 drowned, per Tanzania's Daily News, which left Charahani alone with the floor above his head and ceiling underwater. "Their screams were so loud," he recalls of the disaster. "I think they struggled and drowned almost immediately." Then came the silence and the dark. A good story but not news. Taking a ferry in developing countries is often high risk because the people are so stupid. They will pack in like rabbits, crowd to get off, rush from side to side forgetting that boats need balance, etc. My worst example was not a boat, but a Toyota pickup rigged to be a bus. There were 28 people plus luggage packed into this small pickup. The tire load was likely way over specs. Our two seats hung off the back. Anyway, they stop for gas at someone's house, and a guy comes out carrying a 5-gal can of gas. He took off the gas cap and proceeded to open pour the gas while smoking a cigarette. We jumped off the truck and stood about 30 feet away. All the other passengers looked at us like we were nuts. They had no clue.